Niagara Falls, NY - Renee Mathews, Highland Community Revitalization Committee executive director, shows off some of the vegetable seeds donated by the Sample Seed Shop for planting in new garden beds at Henry J. Kalfas. 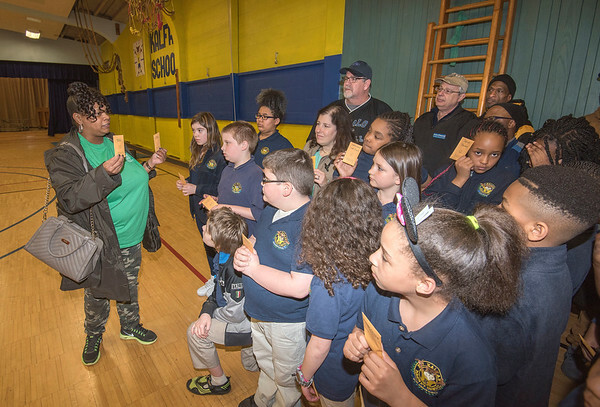 The Highland Community Revitalization Committee (HCRC) and Niagara Falls Council member Kenny Tompkins are bringing some basic and timeless lessons to students in the Niagara Falls School District. On Friday, May 5, schools including Gaskill Prep, Hyde Park Elementary, Henry J. Kalfas, Niagara Street, and GJ Mann Elementary, will receive garden beds in which to start community vegetable gardens. Renee Mathews, executive director of HCRC explained that the beds came from a grant from the William G. Mayne, Jr. Business/Community Enhancement Program. Last year, five garden beds were installed at Kalfas Magnet Elementary School; this year, 10 more beds will be installed, giving children a chance to learn about gardening and the surrounding community a chance to harvest fresh vegetables. “HCRC would like to send out a warm thank you to our sponsors and schools for their participation and enthusiastic support,” she said. The school district is grateful for the partnership. Join us at 12:15 p.m. Friday May 5 at Kalfas, 1800 Beech Avenue, to watch the process and get a photo. “We will have dirt and seeds and people joining us to help build and plant; we have a seed shop plant expert also along to answer any questions,” Tompkins said.